Starting a dropshipping business is one of the easiest ways to make money online in 2019. The growth of Amazon, eBay, Etsy, Shopify, and other online marketplaces and platforms means that anyone can start an online store for as little as $20. But with the barrier to entry being so low, dropshipping has exploded in popularity over the past decade, meaning that many markets are highly competitive. If you’re thinking of starting a dropshipping business - either as a side hustle or a means to leaving your full-time job - you can save yourself time and set yourself up for success by following the simple steps outlined below. There are thousands of people around the world who make five-, six-, and seven-figure incomes from dropshipping and there’s no reason why you can’t do the same. 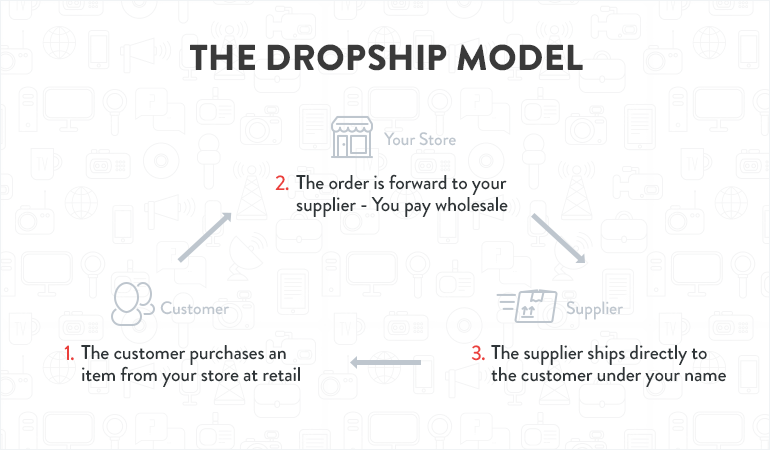 Understanding how the dropshipping business model works is important, as it’s quite different to traditional retail and eCommerce businesses. This means that you - the dropshipper - don’t have to buy and store bulk stock, which saves you having to invest a lot of money upfront. It also eliminates the risk of buying in bulk and not being able to sell all of the products, leaving you out of pocket. This is why dropshipping is so popular - it requires minimal investment, but reaps similar benefits to traditional retail models. Dropshipping Statistics: Do the Numbers Add Up? The hype around dropshipping means some people are sceptical of it as a viable business model and cautious about diving in. There is limited information about dropshipping specifically, but these statistics should help to provide you with peace of mind (and, hopefully, a sense of excitement). 22-33% of online retailers have adopted dropshipping as their primary business model. Dropshipping accounted for 34% of products sold on Amazon in 2011. That’s $14.2 billion of drop-shipped products from just one online marketplace. The average profit of a manufacturer that dropships is 18.33% higher than a manufacturer that uses traditional retail models. Global eCommerce sales amounted to $2.3 trillion USD. Projections show a growth of up to $4.48 trillion USD by 2021. 84% of online sellers say that establishing positive relationships with dropship suppliers is the number one roadblock to starting an online business. Google Trends data also shows a massive increase of interest in dropshipping over the past few years. A niche is a segment of a market. For example, bluetooth speakers are a popular niche in the home audio market. You could even say that outdoor, waterproof bluetooth speakers are a sub-niche of the bluetooth speaker niche. You get the idea. The more specific your niche is, the better. Choosing a niche is the first step to starting a dropshipping business. The rising popularity of dropshipping means it’s becoming harder to find niches that aren’t already saturated. But new products and niches are emerging every week, so the opportunities are almost endless. A common misconception about dropshipping is that you can be successful and profitable in any niche, but that’s simply not true. If you choose a niche that’s already saturated with sellers or dominated by major brands, you’re going to face an uphill battle with your new business. Start with your interests and passions: Tap into your hobbies and interests. If you enjoy travel or hiking in the outdoors, you’re going to have unique knowledge of the products and trends in those markets that can help you identify a viable niche. Scratch your own itch: This is old school entrepreneurial advice. The theory is, if you have a problem in your life then it’s highly likely that others will have the same problem. If you can identify a product that solves that problem, you might have uncovered a great dropshipping niche. Research the competition: Is the niche you’re interested in over-saturated? If so, is the competition easy to beat? Better yet, is it worth beating them? You’ll often find that the niche you’re most interested in joining is the one that nearly everyone is already a part of. This doesn’t mean you can’t hop on the bandwagon, just be ready for some competition. Ensure the niche is profitable: The objective of business is to make money, right? Therefore, you need to check the profitability of every dropshipping niche and product idea that you come up with. Ideally, you want a profit margin of at least 40% after shipping costs, seller fees and taxes, but you should be aiming for margins of 100% or more. PRO TIP: You can use this online calculator to determine the profitability of products you are thinking of selling. It deducts Amazon fees from the retail price and estimates how many items are being sold each month, which is an indicator of demand. While it’s possible to dropship everything from toothpicks to the kitchen sink, some products are more suitable for dropshipping than others. Not dominated by major brands: What’s the first company that comes to mind when you think of the word ‘smartphone’? Apple, probably. Or Samsung? These major brands have the smartphone market on lockdown and it’s going to be tough for any business to compete for a slice of that pie. A good dropshipping product isn’t dominated by a major brand so that you can have a greater chance of capturing a chunk of the market. Small and lightweight: The general rule is that a good dropshipping product should be able to fit inside a shoebox and weigh less than 2kg (4.4lb), the weight limit for ePacket. This is to save you paying extra for shipping. Non-seasonal: Ideally, when you’re starting out you want to avoid products that are only in demand for one season a year. For example, selling something you’d only use at the beach during summer, or Christmas decorations really limits your selling power during the off-season. Choose dropshipping products that are in demand all year round. Retails for between $15 and $200: This price range is known as the eCommerce “sweet spot”. Anything cheaper than $15 and you’re not going to be making much of a profit margin and anything over $200 is going to be difficult to sell en masse. While there are plenty of exceptions to this rule, following it will make your dropshipping journey easier to begin with. Now that you know the criteria for a good dropshipping niche, you can start narrowing down product ideas for your eCommerce business. You should aim to brainstorm at least 10-20 product ideas and then use the guidelines above to either qualify or eliminate them from your list. Once you’re done with that process, you might only have a few product ideas that are considered viable. If you have none, then you’ll need to start the process again. If you have at least one solid product idea at this stage, you’re ready to progress to the next level. It can help to give you product ideas and save you hours of time that it takes to conduct market research manually. If you want to set yourself apart from the thousands of others who are thinking of starting a dropshipping business in 2019, you need to have a few tricks up your sleeve. You need to find a way to be better and smarter than your competition so that you operate more efficiently and make more sales than they do. How do you do this? The same way that champion sports teams, like the Philadelphia Eagles or the Golden State Warriors, prepare each week - by studying the competition. Identify the competition: Start by finding the top sellers in your niche on Amazon and eBay. Also take note of how many sellers are in the niche. Analyse their product listings: How do they set up their product listings? What are their photos like? What kind of sales copy do they use? Find ways to make yours better. You might identify unique selling points you can use or other improvements that will make your product listings more attractive for prospective customers. Read customer reviews: Take some time to scroll through the customer reviews for a few of the top sellers in your niche. Take note of what customers liked and what they complained about so you can refine your approach to customer service. When you’re starting a dropshipping business you should absorb as much information as possible from as many sources as possible. Product listings and reviews of top sellers in your niche are perfect places to look for ideas to improve on what your competition is doing. Actually be a dropshipper: Not all product suppliers offer dropshipping as a service. Some are simply wholesalers or manufacturers. Before you make contact, make sure the supplier is a dropshipper. Have experience (+ helpful staff): You want a supplier that has years of experience with dropshipping. Suppliers take on a lot of responsibility with dropshipping so you want to be sure that you can count on them at all times. A good sign is if the sales rep you’re in contact with seems helpful and well-informed. If you suspect they’re not experienced, go elsewhere. Not charge huge order fees: It’s quite normal for dropship suppliers to charge a small fee for their services. After all, they’re holding onto stock and organizing packaging and shipping for you. These fees should only a few dollars ($2 to $5 usually). If a supplier charges you more than that, you should let them go. Provide fast shipping: Most dropship suppliers are located in China so you can’t expect overnight shipping. However, you do want to make sure your customers will get their items as fast as possible. Check their shipping times to the countries you service. One-two weeks is acceptable for dropshipping. Any longer than that could result in negative customer feedback. Have quality products (+ product photos): You should always request product samples to test quality prior to committing to a supplier. The supplier should ideally have high quality images that you can use in your product listings. Provide referrals on request: A good supplier should willingly connect you with businesses that can verify their service. Ideally, you want word-of-mouth referrals, but failing that you might be able to make your mind up based on customer reviews online (although be aware that online reviews can be manipulated). There are essentially two ways to find good dropship suppliers. You can either search online manually or use a wholesale directory like SaleHoo. Searching for suppliers online: You can simply type your product plus “supplier” into Google and see what comes up. Or you can search for your product on websites like Alibaba.com or Aliexpress.com. A lot of China-based suppliers use these websites to sell their wares. Using a wholesale directory: This can save you a lot of time and help you avoid eCommerce fraud. SaleHoo has more than 8000 suppliers that have been vetted and verified. You can contact them in just a couple of clicks and have confidence in their ability to provide good service. If you’re setting up your business in the United States or Canada then you most likely need a sales tax ID (also known as retail or reseller’s license, tax ID, resale number, resale certificate or vendor's license). Sales tax is a tax levied on all sales of physical goods to consumers and is typically about 6-9% of the sale price. Most states require you to have a tax ID, but there are exceptions, including Alaska Delaware, Montana, New Hampshire, and Oregon. and register for your license. It’s standard for businesses to pass this expense on to consumers by adding it to the retail price. Applying for a tax ID is easy and inexpensive. You can do it by visiting your local county clerk’s office or online – just Google “[your state] + sales tax ID”. To get a sales tax ID, you may need to be a business entity, a company, or a sole proprietor (which applies to a lot of at-home online businesses), and have a Federal Tax ID number. While it's important you collect the exact amount of sales tax (otherwise you’ll be held liable for the difference), not all eBay sellers need a tax ID. That said, some wholesale suppliers require you to have one before they will do business with you. Related: What is an EIN number? So you’ve decided on a product and you’ve lined up a supplier - now you need a place to start selling and making money. Choosing the right selling platform or online marketplace is crucial to the success of your business - but which platform is best for you? You need to decide between selling on an established platform, or starting your own independent online store. Let’s take a look at the pros and cons of the different selling platforms and online marketplaces. Most dropshippers use a well-established online marketplace like Amazon or eBay, especially when starting out. Why? That said, here are a few of the most popular online marketplaces for dropshipping businesses. Amazon: The most well-known of the online marketplaces, Amazon is said to have 300 million active users. In 2016, more than 100,000 sellers made more than $100,000 on Amazon. Amazon offers additional services such as Fulfillment by Amazon and Amazon Prime. Fees vary a lot, but it’s estimated that most sellers will pay about 15% of their sale price to Amazon. It’s a popular option for dropshippers. eBay: eBay is said to have 171 million active users with about 1 billion products listed across 190 different markets. eBay charges listing fees (but offers a limited number of free listings) and sale fees, which are generally less than 10%. eBay has an auction option and also operates as a standard online retail platform. Etsy: Etsy is said to have 54 million members, about 2 million active sellers, and about 32 million active buyers. It’s extremely popular with women (84% of sellers are female). Etsy has established itself as a more trendy online marketplace with a focus on arts, crafts, homeware, and handmade goods. For a full list of alternative eCommerce platforms, check out this post. A lot of dropshippers take the route of starting their own online store. While it requires more investment up front, this is really the ultimate long-term option for making money and building a business online. There are plenty of online tools, like Shopify and SaleHoo Stores, that make it really easy to get started. You have complete control over branding, design, layout etc. If you have the time and money to invest in your dropshipping business and you’re planning to be in it for the long haul, then starting your own store is a good option, especially with established platforms becoming more and more saturated every year. Now that you have a selling platform for your dropshipping business, you need to attract customers to your store. This is where a customer acquisition strategy comes in. Customer acquisition is the art of persuasion. You can think of it as advertising and marketing. Sounds expensive, right? But it doesn’t have to be. You can take the fast (paid) path or the slow (free) path to gaining new customers. Let’s take a look at both strategies in more depth. For a comprehensive guide to Facebook ads for beginners, check out this post. Influencer marketing has become a huge part of customer acquisition for retail brands in recent years. It could play an important part of any customer acquisition strategy in 2019. It can be particularly effective if you are in a trendy niche. For instance, if you’re selling a new style of handbag, you could reach out to an Instagram model and ask if she will share a post of her with the bag, tagging your business. One post can result in a bunch of new fans and customers. The cost of influencer marketing depends on how famous the influencer is. A post from Kim Kardashian might cost $250,000, while a post from a model with 10,000 followers might only cost a few hundred dollars. Building an email list is still one of the most effective ways of acquiring customers. You need a way of capturing email addresses, such as a request to sign-up at checkout, or an offer or competition that requires an email address. Once you have a decent list of email addresses you have a way of reaching a large group of people regularly, for free. As you can see there are several strategies to attract customers to your store. What is your preferred method of growing a new dropship business? Huzzah! We’ve reached the end and, by now, you should be well on your way to starting an eCommerce dropshipping business from scratch. The work is far from over, though. Now you have to successfully run your business. But don’t worry! As long as you follow these next few tips, you’ll have a successful eCommerce drop shipping business for years to come. Stay on top of your social media. Refine your ads, run contests, and promote like crazy. We hope you’ve enjoyed this article on how to start a dropshipping business. Did this inspire you to create one? Leave a comment down below. And don’t forget to share this article with your entrepreneurial friends. Send me what you can please, looking to start dropshipping online. I am going to give it a shot. I havebeen trying to sell things online and have bi success. I am new to the "Drop Shipping" world and or idea. I'm definitely interested in hearing more about how to run a full-time successful online Drop Shipping business. My niche or my biggest interest has always been buying, selling, and trading. Finding the best deals out in the market and turning those deals for profit. The idea intrigues me. Please send me the list you offer for high "niche" products, most wanted, needed and desired products in the market today. Please send me more information about your business, as I would like to educate myself on how to run a successful Drop Ship home based business. Thanks kindly! Hi if i want to to a lingerie online with all the brand in my web is it a supplier that. Ishould look for also ? A totally baby in this kind of business which is interested to know everything about this type of business. Wish I woud've known this earlier. Awesome ! Can't wait to delve in and start ! Is it okay if I'm in the Philippinesand my supplier and customers are from united states? Thanx for the article. It is succinct. I don't see much difference between platforms but i notice that you mention most of them exсept Aliexpress.com and Dropwow.com. Why is that? The article is a good reference for a new biz like me. I am interested in to venture into the dropshipping business but still hesitant to do so. I really need articles like this to keep me informed and intrested. Thank you BillLee. Hi, This is maggi from outside USA but i want to do drop shipping business in USA only . because of my local market place is not that much profitable sale . If you are based outside the US you can use the equivalent in your country. Hope this helps! Great advice & it too saves me a ton of research time. Thank you so much for this information. I am looking into starting my own online business and this has really helped me. I have a question. I sold a game of amazon and it said it would take 14 days to settle my account. It is a fairly new account and was my first sale, and I used PayPal for the payment method. So my question is, do I have to have my own money to drop ship, meaning they pay me but I don't get the money by the time I have to place the drop ship order. I am new to this and if this is the case, I'd need to start drop shipping really inexpensive items to get the ball rolling or wait until I receive the payment in my account. Yes at time you will have to pay your dropshippers with your own money first so that they can process and ship the order to your customer. Especially when a payment hold occurs. I want to start my dropshipping business and I am feeling salehoo really can help me.Your article is very informative.Thank you. SaleHoo itself is a directory. We have over 1,000 suppliers that will dropship products on your behalf however. You can use SaleHoo to find the perfect dropship supplier for your needs. For each dropshipper you will get contact info, their product range (datafeeds) and quality, details on where and how they ship, and more. You can be confident that each supplier is legitimate and will fulfill orders on time. I like this it's easy and reliable. WOW, nice infomations, and the steps also is really important to understand for every readers who interested to create their own business like Drop Shipping, this is really good topic for me because that is the kind of business I want to have, and I learned a lot because of this blog. Thank you for sharing tips. Thanks for such a beautiful write up. I just want to know about the Tax Id. I am from Africa and I’ll like to dropship to customers out of Africa as well. How do I get around this ? You will need the equivalent from your country which is VAT. Please consult with a local account for proper guidance. @Amaka I'm also from Africa , Nigeria to be precise. I'm looking forward to starting dropshipping like you. I'm really scared how it's gonna work out. Very good information, thanks for taking the time to put together all of this so that we can be on the right path to business. I sure will put this information to good use. hello i hope my question will make sense but i wanted to find out if it is possible to put your niche up and when the buyer pays, use part of that money to pay for the product that has been bought and keep the extra. The reason why i am asking is because some of the sites like ali express hold the money for some time and you wont be able to withdraw it till the customer is satisfied or after a specific period. so i wanted to find out if it is possible to still use the money to make the payment for the customer. cool tips man! will need to find an influencers niche. Despite I work with visual arts, I had an idea of starting drop-shipping like a year ago. Finally i did! Good I found Bitdegree free secret formula dropshipping courses. Good lecturer and well explained, I made everything by myself and already in the stage of driving sales. Thanks so much for your article. That description explains everybody in simple steps, what can be done to keep growing. I recommended your text and wish you page more attention! If you are interested in starting Drop shipping business, you should be aware of technology stack for e-commerce development. I have a wordpress website, can I start dropshipping business with my own web site? You can, yes. For as long as your WordPress site is capable to accept payments (PayPal, credit cards, etc) then you're good to go! I agree this information was the easiest and most informative yet. I just need to decide on dropshipping or have my own online. Once my decision is made I now feel more confident I can make this work. Basically when you open up a business, be it online or offline, a sales tax ID is needed (regardless of location) to legitimize things. It's also referred to as VAT, GST, or ABN in other countries. Thanks for sharing this interesting article. It was indeed very informative. I would recommend you to add Spocket in this list as well. I had a very good experience with them. I have a question. I am from Pakistan and want to start a dropshipping business store for the USA with Aliexpress. Is the US Sales Tax ID is necessary for me? If yes, then how can I get that ID? Also, which payment methods we can use because PayPal is currently not in Pakistan. If you live in Pakistan and don't have any physical presence in the US (like a physicial store or an office based in the US), then you're not required to have sales tax ID. If suppliers require this, you can present something equivalent that you've acquired in Pakistan. Sales tax ID is also referred to as VAT number, GST, ABN, or a reseller's certificate in other countries. Your thinking is outstanding. By "Dropshipping Business", I must be helpful. I really appreciate your idea. Dropshipping is good for starters with minimal capital and it allows you to sell single items at a time. Very thorough article - I can see how establishing a niche product(s) for your business is the differentiating factor between just being another online entity and being a specialist in your field - increasing credibility and confidence through focused knowledge of your product line. Hi Gilbert! You can learn more about dropshipping here: https://www.salehoo.com/dropship And that's true - focusing on a niche, even when dropshipping, narrows down your target market and encourages repeat sales. Hi Sir, is this only applicable.for united states? That's the cool thing with dropshipping - you can sell anywhere you want, anywhere in the world. Just make sure you follow you supplier's agreement, as well as your selling site's terms and conditions. Hi Eniola! I'm glad you found this blog helpful. There's more you can learn from this guide: https://www.salehoo.com/dropship Cheers! You can definitely do so with minimal capital. First, I'd like you to understand how dropshipping works through this link and when you're ready to find suppliers, you can join SaleHoo here.